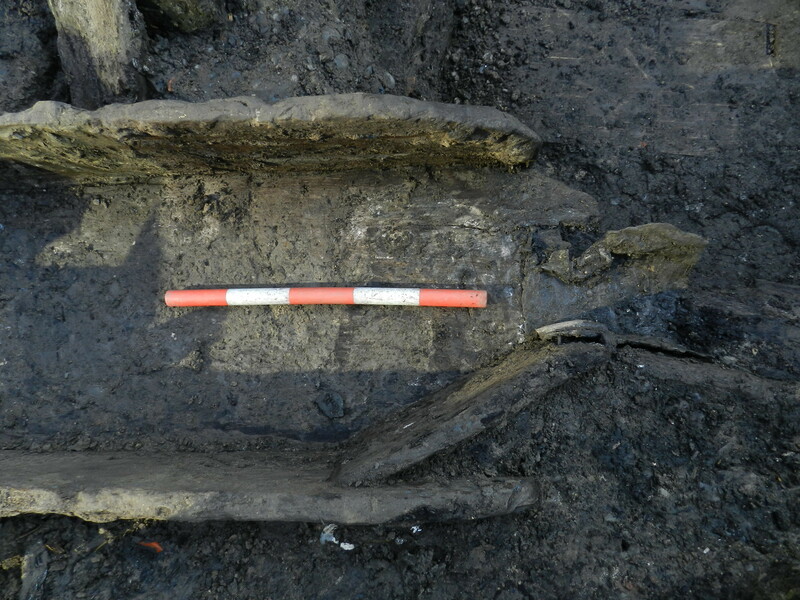 You may remember that back in November we blogged about the amazing system of drains that covered the site. Well, this week we uncovered a particularly nice example. The southern end is truncated (partially cut away) by the foundations of a 1950s building, so we cannot be certain exactly where it led, but the surviving section runs from north to south (in the direction of the Thames rather than the Walbrook). 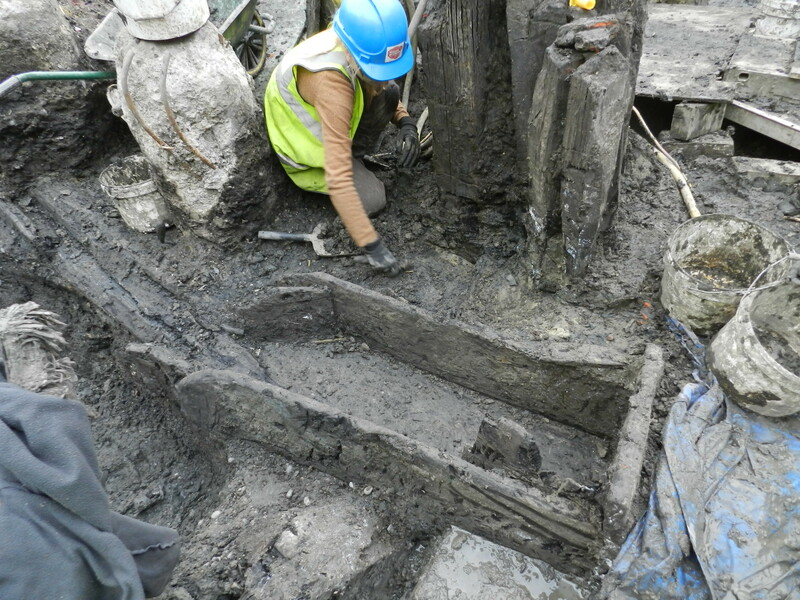 The northern end appears to be complete, with the remains of what could be a wooden down pipe still in place. Near to the truncation the drain gets considerably smaller. 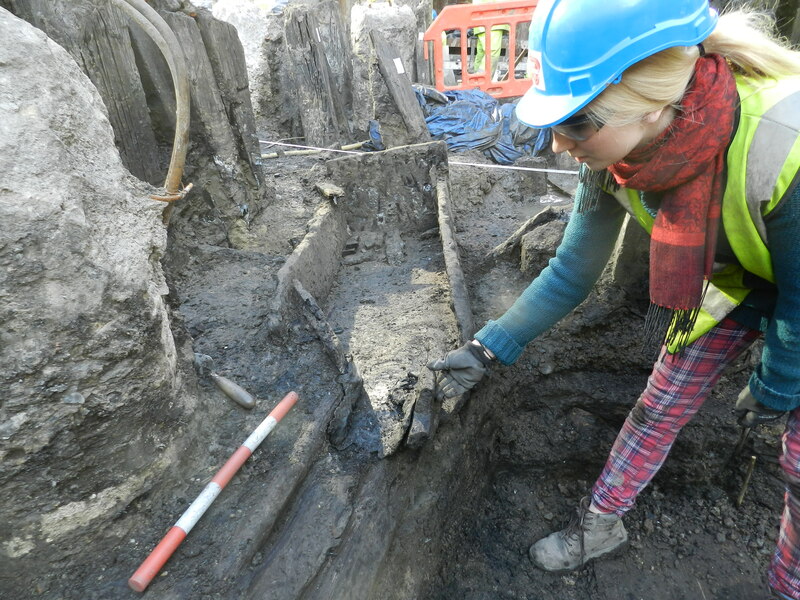 The much wider and deeper northern part is connected to a narrow southern channel by a lead pipe, nailed into the wood. We believe that what we are looking at is a water trough. Clean water would be fed into the trough through the downpipe, which was probably positioned to catch rainwater as it ran off a nearby roof. The narrowing of the channel to the south would cause water to back up and fill the larger northern portion. This would allow clean rainwater to collect whilst maintaining a flow to stop it becoming stagnant or overflowing. Similar drains were found during the excavations at No.1 Poultry, and may have been widespread across Roman Britain; they’re much easier to build than a deep well, and have many more uses. We can only speculate as to how many Roman togas and amphora were washed here, not to mention how many Bacchic revelers tried to sober themselves up in it! If nothing else, its a shame to let all this rainwater go to waste!